Tail waves, frills, and crocodile lizards: Adventures with bizarre lizards in rural ChinaMartin Whiting, Macquarie UniversityMartin Whiting has been working in China on some of the most interesting and unusual of lizards, in habitats that range from dry sandy deserts in the north to wet tropical rainforest in the south. 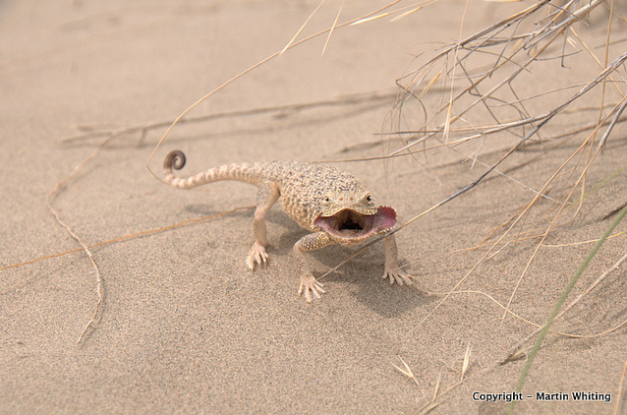 In this talk, he will provide a visual tour of the many species of toad-headed agamas (Phrynocephalus) he and his colleagues have been studying, and their highly elaborate tail waving displays. He will also provide the answer to the question of why the secret toad-headed agama (Phrynocephalus mystaceus) has a frill. Finally, he will talk about the highly endangered crocodile lizard and the attempts of the Chinese to breed it in captivity and bolster natural populations. This talk will be a blend of basic science, natural history, and the benefits, fun, and challenges of conducting field work in China. Not a member of The AHS? Join Us Today!